The association between The Outer Worlds and Fallout: New Vegas is impossible to escape – and it’s not like Obsidian was shy about name-dropping the fan-favourite title in that first reveal trailer. One of the hallmarks of a Bethesda-style open world is mod support, and the devs want to make it happen. But you probably shouldn’t expect official support at launch. “We’d love for players to be able to mod,” co-director Leonard Boyarsky. “We’re going to look into that after we ship, in terms of what kind of support we can have for it.” That comes from Game Informer’s interview with Boyarsky and fellow director Tim Cain, which follows the outlet’s usual rapid-fire question format. The pair is further asked if “the plan is to release a game that players won’t have to finish on their own this time.” They both laughingly say yes, and Leonard adds that he likes that “this time.” Hopefully The Outer Worlds does indeed enjoy a bit more QA time than New Vegas did – especially since we’ll apparently have to wait a bit for mods. Some other notable bits from the interview include the fact that there is hacking, but no hacking minigame, a reputation system, but no morality meter, lots of endings with an old-school set of slides to let you know what happens after the game concludes. Oh, and “hell no,” there won’t be any microtransactions. 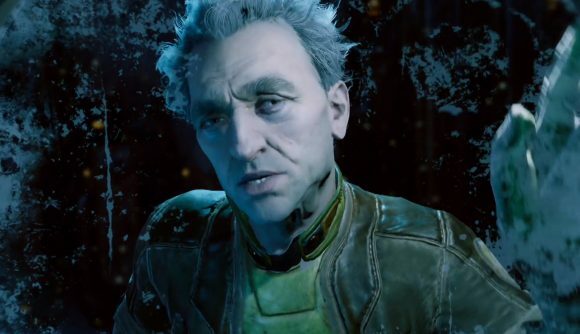 Sadly, there’s no change on The Outer Worlds romance options – you’re still going to have stay chaste with your companions. And now I think I just realised what the community’s first mod is going to be.